Many times when working on articles, or doing research I’ll come upon posts, pages, or articles that look interesting, but after I click to them, I realize they are from 1999 or 2001. While well written, anything that happened that long ago is usually irrelevant to the search marketing and site design business. The Google Info View lets me limit the dates much like Google Blog Search. Nice. It looks as if there may be the need for a new meta-tag (e.g. like the currently valid ‘address’ tag) which helps pages identify dates, locations, etc, because most of the page results came back “No locations for this page” or “No dates for this page”. The date sorting feature was slick in concept but I’ve not made it work very well. I wonder if new meta tags or sitemap tags will help to categorize pages into these buckets. The locations page was wonderful when you’re trying to get information relevant to the locale, but you’re not really searching for a local business. I searched for “Search Marketing Seminars” and chose Chicago as the “location” — the results were limited in a very clean way. It works like a filter – but I couldn’t quite pick out what it was trying to do. 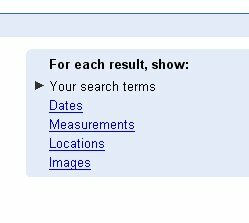 I had to do a lot of different searches before I found a good results page showing the feature well. One usability issue… it’s easy to forget you’ve not entered a date yet. I think Google should either allow a default, or show “no” results until you’ve chosen a date, if you’re in that mode. The results that return when you’ve not entered a date are nonsensical. 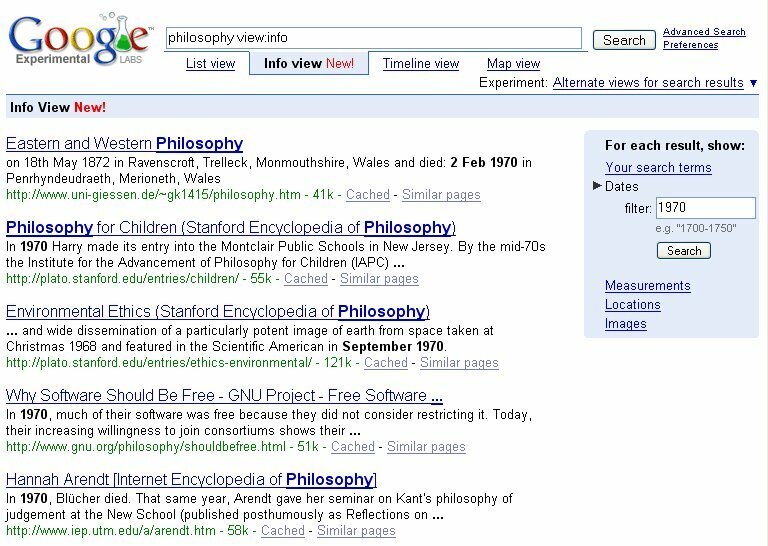 I’d like to see them pop a timeline on the left side like Google Blog search has – with a default. It’s too early to say how this would affect SEO or how businesses might be able to make sure they rank for each of the data types – but it certainly adds some dimensions to the organic search space to consider down the road.